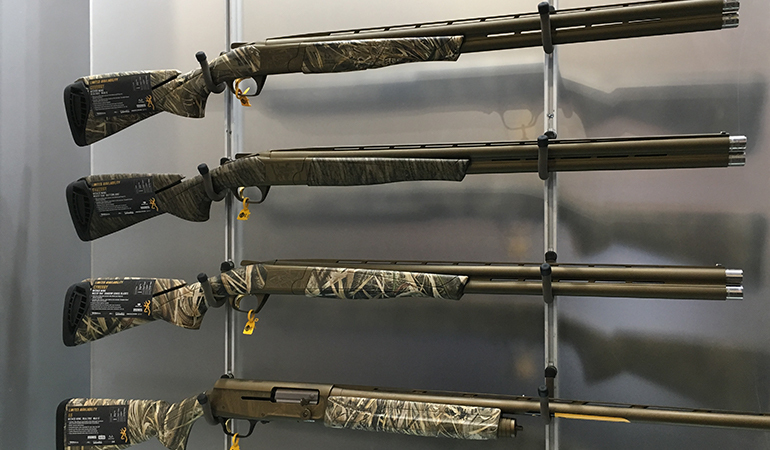 After the first day of the 41st edition of the SHOT Show in Las Vegas, there are a number of new items for waterfowl hunters to consider purchasing before next fall’s duck and goose hunting seasons. If it’s a new shotgun you’re looking for, there are a number of new options coming to market in 2019. Only a couple years down the road since the introduction of Benelli’s highly successful Super Black Eagle 3 flagship model semi-auto, the renowned gunmaker is taking the SBE3 into it’s Performance Shop for some significant upgrades. Thanks to legendary shotgun expert Rob Roberts, the Performance Shop SBE3 Waterfowl model now has a Cerakote Midnight Bronze receiver and barrel, an OPTIFADE Marsh Camo stock and forend, and a HiVis CompSight. With a 28-inch barrel, three Rob Roberts chokes, and five Benelli chokes, the patterning out of this gun should be great no matter what non-toxic shotshell a waterfowler chooses. At only 7 pounds, the gun is easy to handle and even easier to shoot, thanks to Benelli’s Inertia Driven operating system. Finish this superb shotgun off with a Paracord sling, extra inserts for the front sight, and the company’s 40-position shim kit, and one of the most talked about shotguns in modern hunting history raises the bar even higher in 2019. While spring turkey loads are often thought of as the stoutest shotshell loads in the scattergun hunting game, magnum waterfowl loads can be punishing on the shoulder in their own right. Thanks to Beretta’s new A400 Xtreme Plus shotgun, duck and goose hunters now have another reliable shotgun from one of the world’s oldest firearms manufacturers that helps to tame the recoil beast. With a Steelium Plus barrel helping to reduce recoil, along with a new soft comb stock that further reduces the pounding of big non-toxic loads, this semi-automatic can handle the most punishing high brass offerings that a hunter can load it up with. 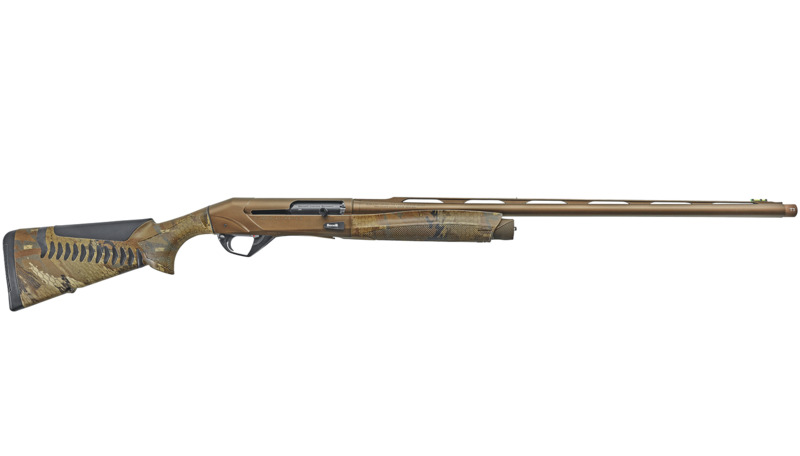 Add five different finish options – including Tru Timber DRT, Realtree Max-5, Optifade Timber, Mossy Oak Bottomland, and black/gray – and the curbside appeal of the new A400 Xtreme Plus stands out even more. Finish this model off with better patterning (thanks to the Steelium Barrel), an enlarged loading port, extended charging handle, and extended bolt release, and this looks like another winner in Beretta’s long run of making top end scatterguns. With the Citori line of over-and-unders being a staple in the shotgun inventory of the Utah based company, 2019 brings out a new White Lightning model in the Citori lineup that incorporates an oil finish, a high-end walnut Lightning style stock and some exquisite engraving work. All that combines to give this stack barrel a sleek and high-end appearance that wins the day both in the field and at the clay pigeon range. With an Inflex recoil pad, ivory mid-and end-sight beads, three extended black Midas Grade choke tubes, and 28- and 26-inch barrels in this 12-gauge offering, and there’s little doubt that Browning’s new Citori White Lightning model should be equally at home in a marshy duck blind, midwestern corn fields filled with pheasants, and at the summertime sporting clay range. As the next step in the progression of CZ’s shotgun lineup, the 1012 utilizes a gas-less operating system that relies on a spring within the bolt to store energy during recoil. The company says that recoil energy is used a split second later to rotate and unlock twin lugs with the barrel extension, effectively withdrawing and ejecting the spent shotshell while loading another round. While there are two wooden models, the Synthetic Camo gun will probably grab the most attention of waterfowlers, especially considering the ability of this gun to go long stretches with limited maintenance. In fact, CZ says that during its testing of the 1012, as many as 5,000-rounds were fired through test guns without a single drop of oil or gun cleaning solvent being used! Waterfowlers looking for custom shotgun shop features without paying the full price for such work are in luck with the new Franchi Affinity Elite Shotgun. Available in both 12- and 20-gauge models, Affinity Elite scatterguns feature a Cerakote and OPTIFADE camo finish, as well as upgraded bolt controls, sighting system, vented rib, and ergonomics designed to provide a better handling and shooting experience in the marsh or a tight flooded timber hole. Franchi doesn’t stop there, giving hunters an upgraded choke system (Close, Mid, and Long-Range) and a lengthened forcing cone, both of which will provide a better pattern for hunters looking for a limit of ducks and geese. The Italian-made Affinity Elite includes sling attachment points on the magazine cap and buttstock, an oversized loading port, ambidextrous safety, a ventilated and chrome-lined barrel, and Franchi’s twin shock absorber (TSA) recoil pad. Finish this gun off with length-of-pull adjustments, a shim kit that allows for drop and cast adjustments, the Inertia-Driven action and an easily removable trigger group and recoil spring, and this gun is a joy to shoot and simple to maintain. Mossberg has a long history of making great shotguns that adults like to shoot at the sporting clay range, in an upland bird cover, or for a day spent chasing ducks and geese out on a windswept open-water point, over decoys in a harvested grain field, in a secluded wet spot, or deep in the flooded woods. Now Mossberg’s long history of making reliable, affordable, and rugged shotguns takes another step forward thanks to the company’s commitment to providing great shotguns for youth. With the new 500 FLEX 20-gauge model that can be adapted as a young shooter grows, the scattergun’s quick-change FLEX stock, EZ-Reach forend, recoil pad connectors, and shorter barrel lengths can help provide a great shotgun for both young and short stature shooters. In the three-year history of Remington’s V3 semi-auto line, shooters have flocked to the VersaPort gas operated scattergun that provides superb cycling of a variety of shotshells along with a softer recoil experience on a hunter’s shoulder. This year, one of America’s most recognized gunmakers expands the series by offering the new V3 Waterfowl Pro that starts off with a new oversized bolt handle and safety and a widened loading port for ease of shotshell loading in a cold duck blind when a hunter is bundled up and wearing gloves. Add in a Mossy Oak Shadow Grass Blades or Realtree Max-5 camo finish, a Cerakote treated receiver and barrel, a sling, a steel mid-barrel sight, and a Hi-Viz fiber optic front sight and fans of Remington scatterguns have another reason to head down to their local gun shop before next year’s waterfowl seasons begin. By upgrading the flagship waterfowl hunting shotgun in its lineup, Stoeger has created a terrific scattergun with tried-and-true performance capabilities along with value. With a 28-inch barrel and a Cerakote Flat Dark Earth finish, the stock and forend offer their own stylish good looks thanks to the Realtree MAX-5 camo pattern. Chambered for 2 ¾-inch, 3-inch, and 3 ½-inch shotshells, loading and operating the Waterfowler M3500 is a breeze thanks to the large loading port (featuring a special-machined and beveled area), oversized bolt handle and oversized bolt release button. And thanks to the M3500’s Inertia Drive operating system, there’s not much chance for a cycling misfeed, not to mention the fact that the shotgun offers a significant taming of even the biggest non-toxic load’s recoil. Add in the fact that the Inertia Drive action is located mostly within the receiver, and the result is a more centered balance for the shotgun as well as a more balanced swing. With five extended choke tubes, a shim kit, a full-length vented rib, a paracord sling, an easy-to-see red-bar front sight, and a receiver that is drilled and tapped for the addition of a scope, and its easy to see how Stoeger wins the day again for a high-performance, rugged and reliable shotgun. I simply love over-and-under shotguns, and this stack barrel scattergun offers everything there is to need in a waterfowl gun that performs well in the field and can take a beating from the elements. From its chambering for shotshells ranging from 2 ¾-inches to 3 ½-inches to its five choke tubes to its Mossy Oak camoed stock forend to its dull finished receiver and barrel, it’ll be hard to go wrong in a 2019 duck blind with this waterfowler’s special, especially when you consider that retail for this over-and-under checks in at under $800! Known for making great pump shotguns and semi-auto loaders for mom and dad, Winchester now has a superb offering for the kids, thanks to the new SX4 Waterfowl Hunter Compact model. With a 13-inch length of pull, smaller statured wingshooters get a better fit, one that can be customized thanks to ¼-inch spacers that Winchester provides. With a Mossy Oak Shadow Grass Blades camo finish, a synthetic stock, a rounded pistol grip, textured gripping surfaces, a TruGlo Fiber Optic front sight, an ambidextrous safety, a Pachmayr Decelerator Recoil Pad, and a larger bolt handle and bolt release button, the bottom line is that there is nothing small in terms of the SX4 Waterfowl Hunter Compact’s features. Add in Winchester’s Back-Bored Technology for better shot patterns downrange and the company’s Invector-Plus Choke System and this is a big-league shotgun that is just perfect for the young waterfowler in the family.